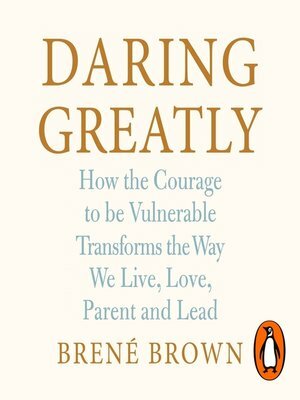 Penguin presents the audiobook edition of Daring Greatly written and read by Brené Brown. Every time we are introduced to someone new, try to be creative, or start a difficult conversation, we take a risk. We feel uncertain and exposed. We feel vulnerable. Most of us try to fight those feelings - we strive to appear perfect. In a powerful new vision Dr. Brené Brown challenges everything we think we know about vulnerability, and dispels the widely accepted myth that it's a weakness. She argues that, in truth, vulnerability is strength and when we shut ourselves off from vulnerability - fromrevealing our true selves - we distance ourselves from the experiences that bring purpose and meaning to our lives. Daring Greatly is the culmination of 12 years of groundbreaking social research, across every area of our lives including home, relationships, work, and parenting. It is an invitation to be courageous; to show up and let ourselves be seen, even when there are no guarantees. This is vulnerability. This is daring greatly.